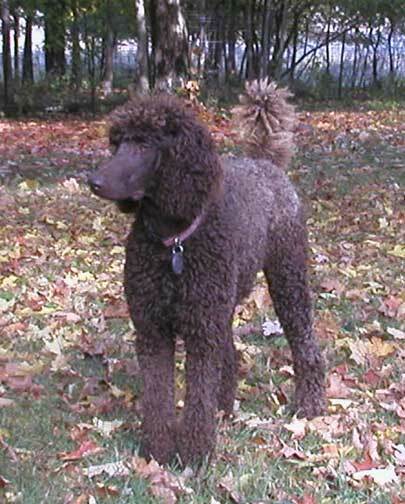 Royal Standard Poodles-Brown Ciwa - Now at home in Australia! 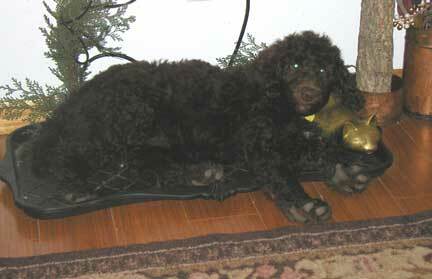 Royal Standard Poodles-Brown Ciwa (See-Wa), our largest female is now FOR SALE. As a breeding female $5,000 proven girl with 3 litters, 10 pups each litter. $1,300 for a pet only which she would be spayed (included in price) before leaving to her new home. Call 218-894-1434 for an interview. 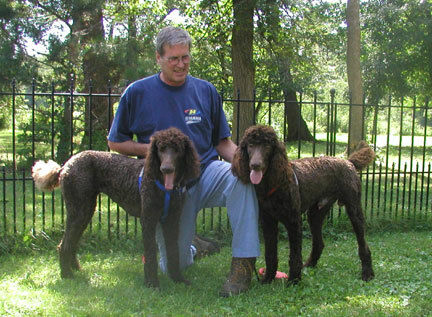 In diversifying by bringing a red non-fading pair of standard poodles into our family, I must decide to let a pair go. Ciwa is so laid back, Royal size and loving she would be a plus for any home. In looking to bring in a new line, I had been in communication with a new friend and breeder from Canada. A customer of mine who loves to research the internet on standards, believed it would be wonderful to bring in one of her pups into our line. 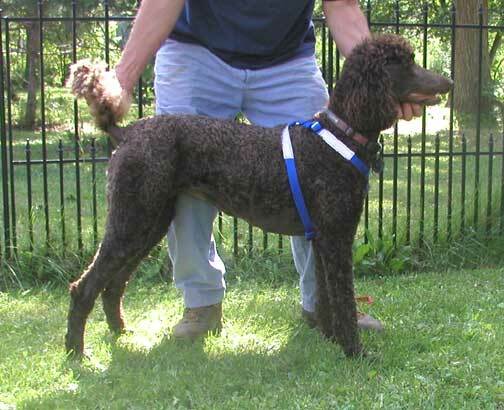 Communication took a new turn and we brought in our new Royal Standard Poodle brown "Ciwa". COI (Coefficient of Inbreeding) 10 generations 1.12%, very low! 8 months; 63# and now taller than Falcon! 26.5" at whithers. 7 months; 61# she is a strong willed playful girl making her mark in the pack. Truly coming into her own lovable mischievous ways (as most alpha puppies do)! 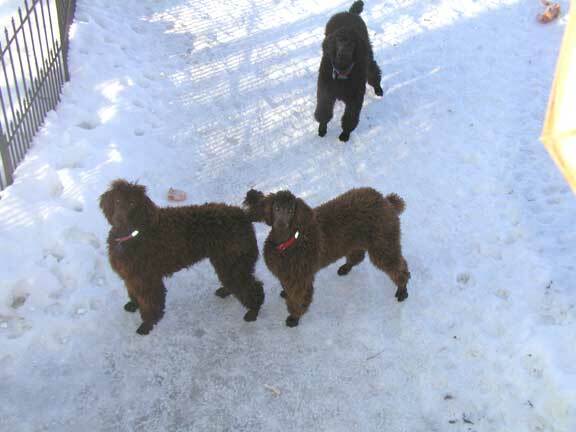 Both Java and Hershey (parents) are "clear" of NEwS - Neonatal Encephalopathy with Seizures this leaves offspring clear. Her antics will live with her until she's old! Loves to jump up and grab things from super high places-like apples off our apple tree. Here she is with brother Bruno below (different litters), enjoying their cool summer hair cuts. 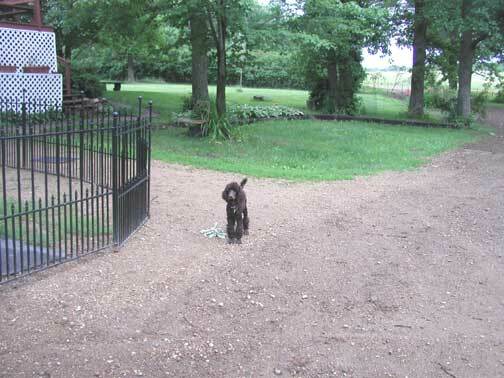 8 weeks old enjoying the parks.